Military vehicles, equipment, ships and aircraft are all exposed to extreme conditions. For the U.S. Armed Forces, only military grade paints that meet stringent military standards are suitable for these conditions. Chemical Agent Resistant Coatings (CARC) are well-known military grade paints. Products meeting this specification resist the penetration of chemical agents and require special storage. This is important for decontamination. Vehicles exposed to chemicals are quickly cleaned and returned to service. There is no danger of chemical agents leaching out from the exposed paint. CARC coatings also aid infrared signature management. The camouflage colors cause vehicles to blend in with surroundings. They remain invisible even to infrared technology. Extreme heat, salt water and chemical agents can accelerate corrosion. The military uses zinc chromate primers for corrosion protection. 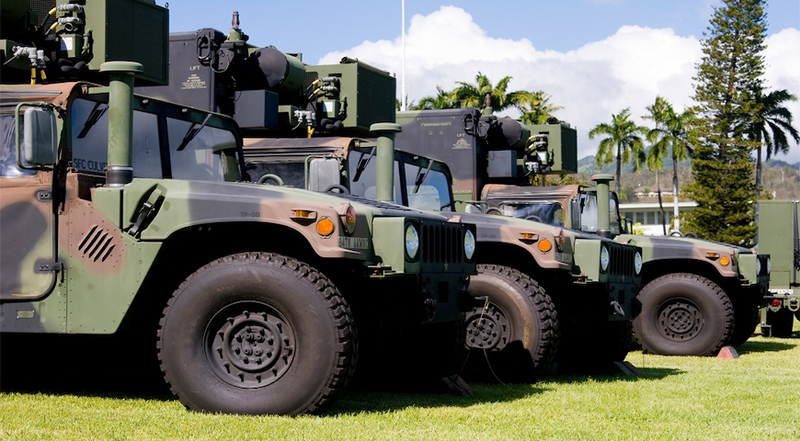 These specialized military coatings are sensitive and represent an investment in protecting vital military vehicles and equipment. They require strict adherence to military grade paint storage parameters to prevent the paint from degrading. The most important of these parameters is temperature control. RELATED ARTICLE: How Does the Military Handle Hazardous Waste Storage? When the temperature of paint drops too low, it separates into its constituent parts. This effect is reversible by reheating the paint. But the more often the paint cycles through this process, the greater the chance that it will not completely mix together again. High temperatures destroy paints. They cause solvent evaporation and chemical changes. It is also important to have a consistent paint application temperature. Temperature variances cause paint viscosity variances, which result in poor quality finishes. Store military grade paint in a controlled temperature range to maintain paint quality and application consistency. U.S. Chemical Storage manufactures prefabricated paint storage buildings that meet the requirements of military grade paint storage. These buildings conform to NFPA-compliant storage for all types of chemicals. Different models are available depending on fire ratings and storage requirements. Paint storage buildings are necessary to meet NPFA and EPA compliance requirements and are typically manufactured with automatic temperature controllers. The Programmable Temperature Controllers monitor and maintain set temperature ranges. Depending on the external climate conditions, the building may activate a heater, cooling equipment or dehumidifier as needed to maintain the desired temperature range. Our military grade paint storage buildings – and all of our paint storage buildings – also come standard with built-in spill containment sumps to prevent environmental incidents. Mechanical ventilation ensures that any flammable vapors do not build up inside the building and create a fire risk. U.S. Chemical Storage supplies paint storage buildings for the military to keep paint safe and protect paint quality. Our team of experts take care of your storage needs so you can focus on mission preparedness. Contact us today to request a free quote. The Business of Viscosity Blog. How does Paint Temperature Affect Different Automotive Paints?